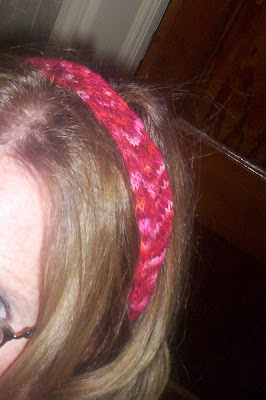 I enjoyed making this Lace Headband. Not only was it an easy, relaxing knit, great when I needed a mental health break from MS3, but I made it from my blogless friend Betsy's hand dyed, hand spun yarn. And, it is my favorite color, red. Please excuse the crummy pic and the even crummier do. That's really pretty! And the upper corner of your forehead and hair look fine. You always look great!